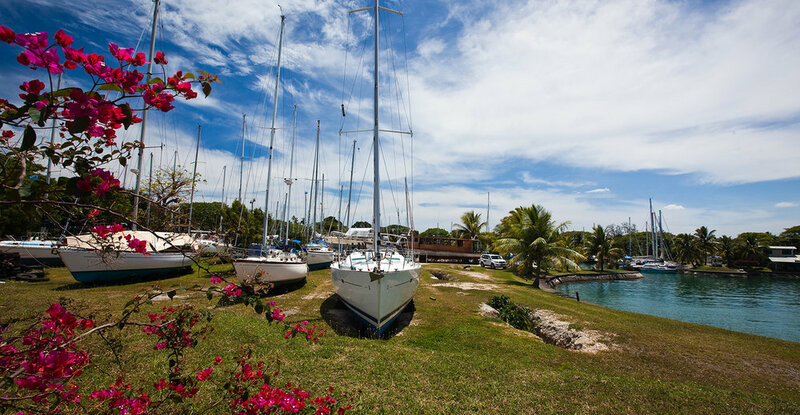 Most of us know a boat that has been left to die in a community slip or at the back lot of a marina property. The owner simply walked away, or passed away, or he doesn't know what to do with it. And it sits there year after year. Some programs, like the popular and successful Chesapeake Bay Maritime Museum's Charity Boat Auction, offer an opportunity to donate a watercraft, even in rough shape, which supports the valuable programs of the CBMM. This past weekend, I got to see all sorts of craft, and anyone looking for a great buy or project boat could do no better than to show up with a checkbook at the museum each Labor Day. The program manager, Todd Taylor, does a great job. Todd Taylor is the Boat Donation Program Manager of the CBMM. It must feel satisfying to help take one person's old boat and find a new owner eager to take care of and use it. Great program. There is a friend of a friend in his early 90s, and his well-loved 1970s-vintage Irwin 34 sailboat is at its end of life. Soft decks, broken rigging, frozen winches and an engine that hasn't run in years...the boat should been taken away years ago. He has been reluctant to part with it. One of his friends is going to pay to have the boat dismantled and broken up. The metal will be recycled along with other components. The fiberglass hull and deck will be cut up and taken to the dump or landfill. I may take pictures of the event. But is that the best solution, given how many boats are out there that need such deconstruction? Frankly, there is little motivation or money to be made in removing the 1,500 derelict boats just in Florida alone. (There are at least four boats on my own Ridout Creek in Annapolis that need to go.) The time and money to take a boat apart is not worth it for the most part. Marinas won't do it. At some point, grinding or shredding the fiberglass into a recyclable material may be viable, but it isn't there yet. No market exists of any size for ground fiberglass, so why do that? 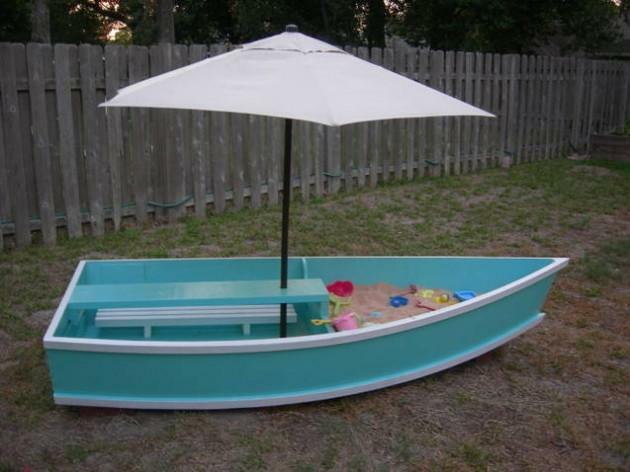 Some smaller boats can be re-purposed, used as a container for flower beds on driveway entrances, and we've all seen that. The same is true for small dinghies and other craft, which might find a home in a seafood restaurant for the salad or oyster bar. But that is a very limited opportunity to get rid of old boats. Back before we got smart about the environment, simply scuttling a boat in deep water was an alternative, as long as all fluids and contaminants were removed beforehand. But that is not an option for law-abiding boaters. No, we need to find another way. The point has been made that automobiles have some design elements to make it easier to get rid of them when they reach their end-of-life time. The auto industry has addressed this to a certain extent. Nothing like that exists in the marine industry, at least not yet. It is going to take some enterprising soul or company to find both a solution to this, and a market for it. Metals, engines, plumbing, and wiring can all be recycled. But the nut to crack is the fiberglass hull and deck. Anybody out there with a solution? I once thought that a big old boat, whether a sailboat or big hunky trawler or motoryacht, would make a fine tiny home for someone. Dig a cyclone pit and put the hull in the trench, and restore a homey interior using the basic fiberglass structure as the shell. Once engine and tanks go, there might be space for a washer/dryer and other domestic comforts. If you ever looked inside a tiny home, it is not a big stretch to view a big Irwin or similar center cockpit sailboat, or even a cozy Westsail 32, as a fun home, and there are thousands of Grand Banks and Taiwan trawlers that would offer palatial accommodations compared to a tiny home at less cost. Is this a future liveaboard community opportunity? Boats inserted in the ground in some creative design that speaks to the nautical flavor of the community? A big step up from a trailer park, a resort "land marina" could be home for many folks who don't need the operational abilities of a boat. Dig a cyclone pit, lower the keel and hull into the pit, and enjoy living your own tiny home experience. Eventually plant flowers around the hull and enjoy resort living. The ultimate B&B or VRBO experience? 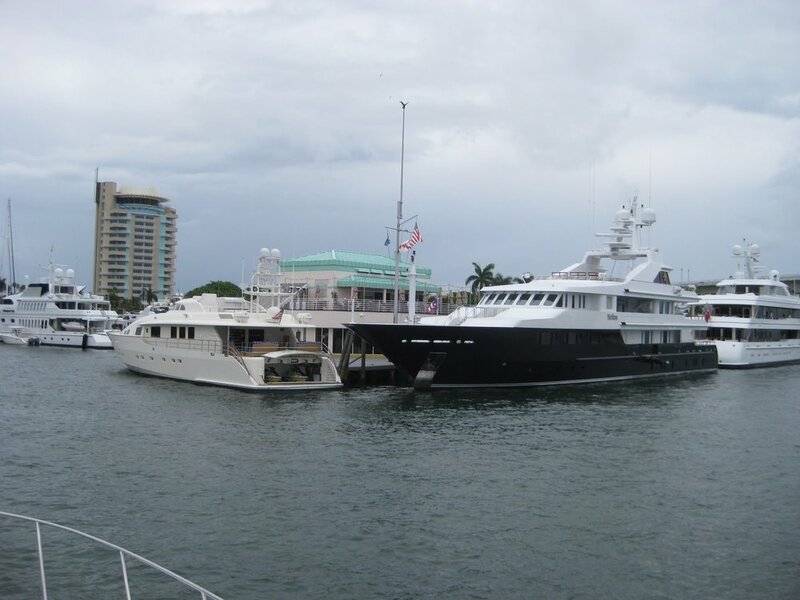 I wrote years ago about the many megayachts in Ft Lauderdale marinas that never go anywhere, never move. Why not have a motoryacht tied to the dock, without engine or tanks or running gear, or any navigation or underway capability, plumbed to city water and electricity. A boat that floats but will never go anywhere except if towed. Live on your own waterfront houseboat that looks the part of the yachting lifestyle, and is a damn fine comfortable home. What a great place to live aboard your waterfront home...who needs engines and boaty stuff if you aren't going anywhere. Too expensive to operate anyway. Just tie into city power and services and enjoy living on your yacht. 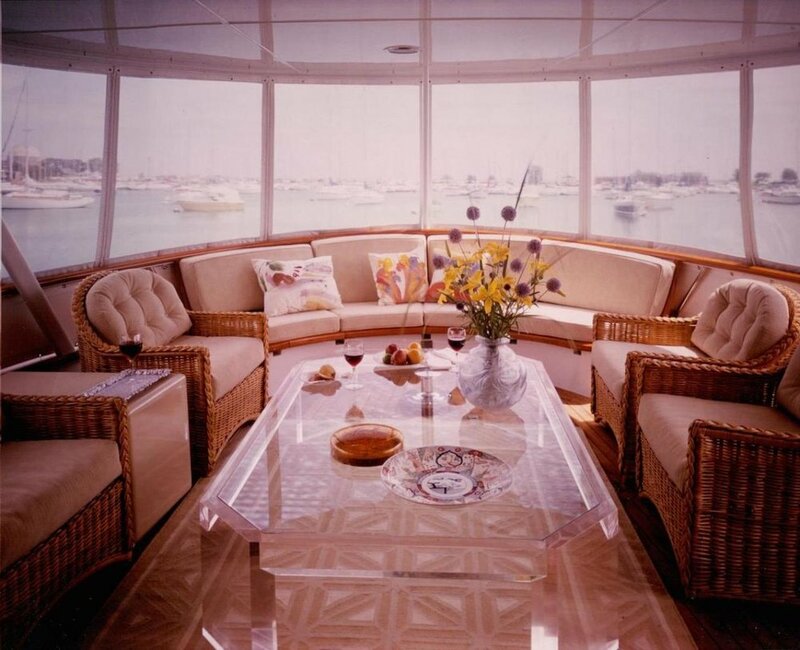 Cocktails on the flybridge at 1700 sharp. This 1964 Feadship canoe stern motoryacht would make a super home if lowered into the ground to its waterline and connected to city services. Just look at the interior pictures. Its superb interior rivals any million-dollar mansion. Eventually remove engines, tanks, and other nautical elements no longer necessary and one finds even more space for other comforts and accommodations. A 600-bottle wine cellar in the engine room! A unique residence one could be proud of. Keep the anchor for a distinctly nautical touch. Getting rid of neglected or half-submerged boats removes more than the eye sore they represent. Most are a threat to the environment. And at some point they just sink, especially in a hurricane. Remember Boot Key Harbor in Marathon years ago? A disaster waiting to happen. Until someone comes up with a better way to eliminate and recycle fiberglass, the best option, at least from a cost standpoint, is to truck them to landfills, which is definitely not the ideal or sustainable solution. But until shredded or ground fiberglass has a viable market and application, it won't be worth the cost of the expensive machines to do it. Thank goodness we have programs that accept donations. One way out for many a mariner who has reached the end of a boating career. Newer PostMonday Minute - Gross Tonnage is not Displacement! Older PostMonday Minute - Where Do Old Boats Go?